All Aboard the Terrain Train is the special level of World 2 found in Yoshi's New Island. 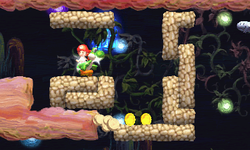 Yoshi starts the level in a cave-like area with a network of moving terrain, with enemies and obstacles along the way. A key can also be found midway through the path, also when the moving terrain starts moving vertically, and then horizontally once again. Eventually, Yoshi must jump on a grassy land mass and make his way to the Goal Ring. Korean 움직이는 지형이 여기저기 한가득! Umjigineun Jihyeong'i Yeogijeogi Hangadeuk! Lots of Moving Terrain Here and There!